Since its opening in June 2014, many people have had fun doing wacky poses with the various art pieces at the Trick Eye Museum in Singapore. The museum has now refreshed its gallery with new sculptures, an interactive 4D concept and new themed zones – “Mystery”, “Excitement”, “Fairytale”, “Fantasy”, “Supernatural” and “Trick World”. More than half the museum has been updated with the new artworks and these were ready on 31 October 2015. …or share some love with Mona Lisa! …and Andy Warhol balancing on some chairs! This horse and carriage (also new!) took up quite a substantial space in this area. A Rubik’s Cube has been placed just before the gigantic book entranceway which leads to the other exhibition zones. Fancy turning yourself into an Andy Warhol-themed painting? Dancing Star – there are 2 choices available and you can opt for the Chinese theme or Christmas theme. The little kids visiting the museum seemed to enjoy this exhibit a lot and kept going back for more! When I finally got my turn, I decided to try the Christmas theme first and was transformed into a Santarina! I concluded that this wasn’t my cup of tea and much preferred the static 3D exhibits. I think this is my favourite out of all the zones! Fancy taking shelter with a Frog? Waterfall – you can pose on that tree stump or across that gaping hole as seen two pictures above. Alice House – Yikes! Looks like Alice is stuck here! Flower Ball – Try imagining yourself being trapped in a water bubble in this picture. Hmm…do you think a hunk or babe would look better in this setting? I noted that “The Scream” has been removed from its previous picture frame and now has a bigger backdrop. Sit and get transported somewhere else by this couple! Afternoon Tea Parties – I don’t know why but I just love this picture!! Ice Cliff – You can play hero and damsel in distress here. However, I wouldn’t recommend that you wear heels if you are perched on a precarious ledge like this! Ice Wall Climb – You can have fun thinking up various poses for this one! This is a brand new zone which focuses on the supernatural. That ballet-themed wall is still there, plus the Merlion. Art Fighter – this is one of the more interactive exhibits as it includes a fighting game. Thanks to Trick Eye Museum Singapore for the invite to the media preview! [CONTEST GIVEAWAY] Trick Eye Museum Tickets and Hee Kee Desserts Vouchers! I have 2 pairs of Trick Eye Museum tickets (2 winners – a pair of tickets each) and $20 worth of Hee Kee Desserts vouchers (2 winners – $10 each) to be given away. (1) The Contest is held on my Facebook page. (2) Click LIKE on Jaznotabi Facebook page. (3) Comment on the contest post in Facebook and let me know which prize you would like to win. (4) Share the contest post (refer step 3) on your Facebook Timeline (remember to set it to “Public” so that we can see it). Contest ends on Monday, 4th August 2014 at 10pm Singapore time. Winners will be randomly picked. You can participate in the prize drawing for both sets of prizes. However, each winner can only win either Trick Eye Museum tickets or Hee Kee Desserts vouchers, but not both (to give more people a fair chance to win). Prize Delivery in Singapore only – at HarbourFront(VivoCity), Serangoon(Nex) or Sengkang(CompassPoint). Expiry Date for Trick Eye Museum tickets is 31st Sept 2014. Expiry Date for Hee Kee Desserts vouchers is 31st Dec 2014. Trick Eye Museum in Singapore! Trick Eye Museum, a renowned tourist destination in South Korea, has made its way to Singapore! 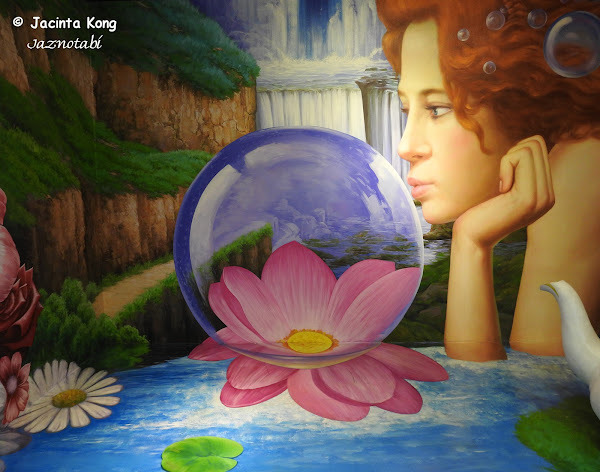 This three-dimensional (3D) art gallery features paintings created using trompe l’oeil techniques that give each 2D art piece the illusion of being in 3D. The museum occupies an area of 800 square metres and features six theme zones (World of Masterpieces, Love in Winter, Star of Circus, Safari Kingdom, Dreams of Fairytale and Adventure Discovery), with 80 3D paintings and optical illusion masterpieces, 50 of which were created specially and adapted for the Singapore gallery. I had been eagerly anticipating the opening of this museum and was absolutely thrilled when I was invited to a preview! The museum officially opens on Sunday, 8th June 2014. Here’s the ticketing booth, sandwiched between the entrance and exit of the museum. This museum is meant to be an interactive one and visitors are expected to pose with the paintings so that they’ll look as if they are subjects within the masterpieces. It’s definitely something that will interest those who love posing for photographs and taking selfies! When you enter the museum, you will be welcomed by a sculpture of a giant baby, which is making its debut appearance here in Singapore. Visitors can pose by getting into the cage – does it look like I’m being held captive by a giant baby? Before I go on further about the artworks on display, let me give you a peek at the ribbon cutting ceremony by the VIPs (dressed in black) from Trick Eye Museum and Resorts World Sentosa (RWS). This is an extract from the Paris Street; Rainy Day oil painting by French artist Gustave Caillebotte. Based on A Sunday Afternoon on the Island of La Grande Jatte – 1884 (French: Un dimanche après-midi à l’Île de la Grande Jatte – 1884) by Georges Seurat, I must say that when I first looked at it, it was very 2D but after I went in and posed for the photo, I could hear people around me gasping cos it was as if the painting suddenly came to life and became 3D! More exhibits await behind that open book with Mona Lisa on its cover. Upon entering and turning to the right, you will need to walk across this illusion of a bottomless pit – well, you can walk around it if you think it looks scary. The Ames Room just blows your mind away. I still can’t get my head around it and it is indeed a very clever illusion! Ohh…I forgot to mention that if you are uncertain of how to pose for the photos, there are some tips given on the signs placed next to the exhibits. I got a model to pose with me (this was a preview event so there were models who were available to pose for pictures) as you need at least 2 people to make the illusion work. Notice that the person on the right always appears bigger than the person on the left? Escape from the Anglerfish – Help! Save me!…. Yippee! How often do you get a chance to ride on the back of a killer whale? Ohhh…this is one of my favourites! The entire scene looks so realistic with the molten lava and the volcano erupting in the background! Synthetic Boots Cat – Aww…the kitty is sooo cute!! You can also have your picture taken with The Little Match Girl and the Leaf Fairy. Someone commented that this looks like a scene out of Harry Potter! Ever wondered how it would feel to be trapped inside a snow globe? Human Canonball – I’m all set, bring it on! Merlion Boat – one of the original artworks created specially for Singapore! Wow…I can do a one-arm handstand! Look Mom – I can do the split! Wow…I had a blast!! It was fun posing with the art pieces but for some of them I really had to analyse the painting before I could figure out how to fit myself into the picture (haha…I was too excited and didn’t check the tips shown on the wall). A word of advice – if you are planning to go alone or as a couple, it’s best to bring a tripod in case you can’t find anyone to help you to take the pictures. I think it’s best if you go in a group of 3 or more, then at least you can each take turns to help with the photo-taking. Selfies may not work as some of the shots require the photographer to stand further back so that the illusion looks more realistic. It’s a really enjoyable place for an outing with family or friends!! 26 Sentosa Gateway, Singapore 098138. RWS Invites members get 20% rebate on tickets to Trick Eye Museum. As part of their Grand Opening celebrations, ticket prices will be at 50% off until 22nd June 2014 but you’ll need to purchase the tickets at their on-site ticketing booth in order to enjoy the discount. Board bus RWS8 from bus stop 14141 at VivoCity or bus stop 14121 at Merrill Lynch, HarbourFront. Alight at Resorts World Sentosa drop-off point, then enter via The Forum and turn left to take the escalator up to ground level. Alight at HarbourFront station, take exit E to VivoCity and head to Level 3 to take the Sentosa Express. Take the Sentosa Express from VivoCity’s Sentosa station and alight at Waterfront station. 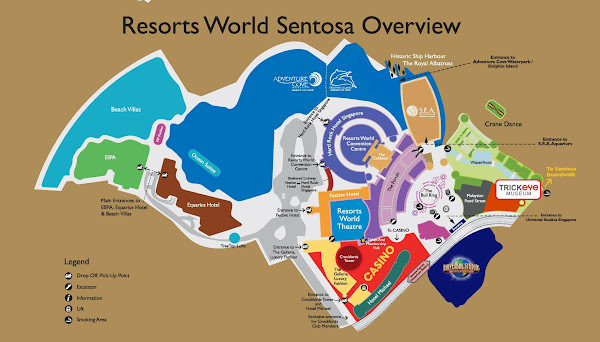 Head to the Sentosa Boardwalk and it’s about a 15min walk to Resorts World Sentosa. Park at RWS B1 East Car Park, Blue Zone. Look out for the directional signages to the Waterfront and take the escalator up.